4 things you need to know about choosing the best host for your blog BEFORE you commit. PLUS, why I chose Bluehost hosting for my site. 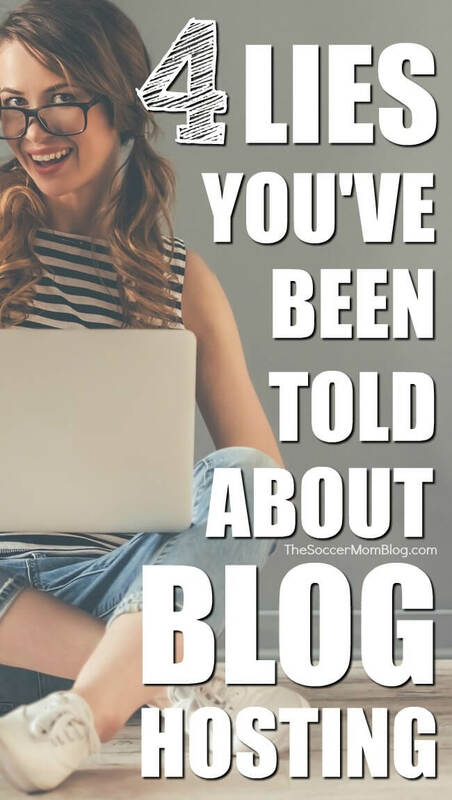 So you think you want to blog? You’ve likely read a lot of different information and aren’t sure which is “right” — I remember how confusing that was when I was newbie! When I started my own blog, I had no idea that I could make any money at all, much less enough to support my family. Sometimes I actually pinch myself, because now I make more than double what I did in my previous career! (Read the 5 ways I started making money as a new blogger). Blogging has been an unbelievable blessing and it just keeps getting better! I love to talk about blogging and helping others achieve things they never imagined possible. I truly believe that this industry will only continue to grow, and there is room enough for bloggers of all types who are willing to go for it, learn the craft, and work hard! Today I’m going to focus on the very basics of starting a blog and untangle some of the confusing hosting myths circulating out there. Choosing a web host is the first and most-important step in creating a blog that will make you money. These are things I had to figure out on my own, but would have been awesome to know beforehand! I’ve included affiliate links for your convenience in setting up your own blog with services I love and use myself; disclosure policy available here. Full disclosure here: I started out with a free WordPress.com blog. However, this meant that when I wanted to start making money, I had to switch to a self-hosted paid hosting plan. Why? Many free platforms have restrictions on how you can monetize (no bueno!!) If your goal is to make a profit, you need to be “self-hosted,” which means you own your own domain name (URL). Plan on starting with a self-hosted blog from the get-go. It will save you the trouble of switching over later down the road (like I had to do). I highly recommend Bluehost for this (more details below). Consider switching over before your site gets bigger and requires more work to transfer. Again, if you want your blog to be a business, this is a must-do! RELATED: Read more about why I don’t suggest a free blogging site, and 4 more things I wish I had known before I started a blog! Another reason to consider paid hosting from the get-go: on a free hosting site like WordPress.com or Blogger, there is the chance that you could lose everything should they shut down or decide to remove your site. This is uncommon, but it does happen. At just a few bucks a month, Bluehost’s Basic plan was such a minimal expense that I could afford it even before I saw any profit from my site. The peace of mind that I own my domain and content is worth it! Why do I personally love Bluehost? I can call their support line at ANY hour of the day if I have a question. (Seriously, their 24/7 support is a lifesaver!) This is invaluable when any downtime from attacks or your own mistakes (oops!) can be costly. And like I’ve said over and over, I truly believe that Bluehost is the best value for the money, especially as a new blogger looking to keep costs down. 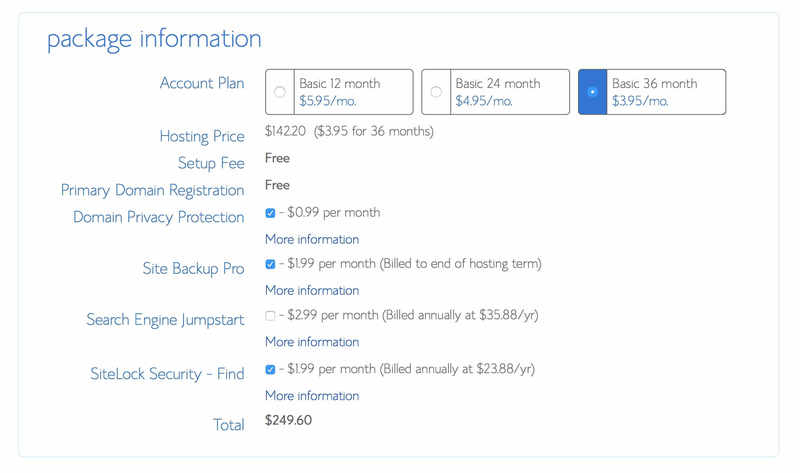 Bluehost recently discounted their Prime Plan to just $5.45/month (I’ve never seen it priced that low before!) The Prime Plan offers SO many features that are usually extra, like daily site backups and domain privacy protection. I definitely recommend snagging this steal of a deal before it’s gone! 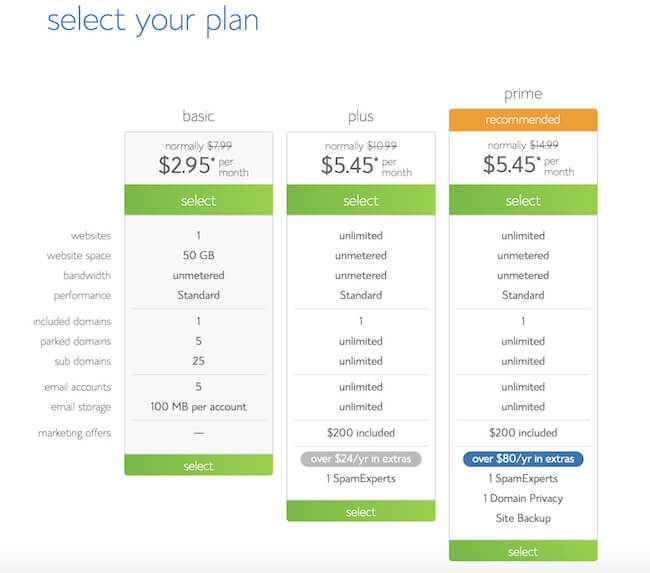 Click here to learn more about the Prime Plan and the blog hosting features you can’t afford to skip. Bluehost is such an awesome company that they’ve offered exclusive pricing for my readers! Sign up through MY LINK for pricing even lower than shown below (starting at only $2.95 a month PLUS you get FREE domain name ($15 value) when you sign up for a year in advance. TIP: I recommend going ahead and signing up for a year or more up-front to get the best deal. That way you don’t have to worry about remembering to pay another bill every single month. If you ever decide to cancel, they’ll refund you the unused portion of your package, so it’s worry-free! One of the things I tell every new blogger I work with is to keep your costs as low as possible for as long as possible. If you spend a ton of cash before you start bringing in any income, it could be discouraging. Plus, it’s not good business sense! Hosting is the only substantial expense you really need to worry about as a new blogger. And if you think about it, a few bucks a month is an incredibly low investment for starting a new business! Another reason I LOVE blogging!! As a member of multiple online blogging communities/support groups, hosting is a popular topic of conversation. I’ve seen experienced bloggers tell newer members that their shared hosting plan is going to max out as soon as anyone visits their site. I stayed with Bluehost from the switch to self-hosted until my site hit half a million page views. Bluehost’s Basic plan easily handled six-figure monthly page views for my site, so if anyone tells you that you need a premium plan when you’re just starting out, I would question their judgement. A close friend of mine who actually is a web/software developer let me in on a little secret: Bluehost is one of his top hosting choices. Why? Because they have the resources that smaller companies may lack. Are you getting excited yet?! CLICK HERE to get started with your very own Bluehost hosting plan! STEP TWO: Select and purchase your hosting package. If purchased through my link, you could pay as little as $2.95 per month! It really is risk free: if for any reason you change your mind during your term, you’ll be refunded the unused portion of your pre-payment. I recommend going with at least the 12 month plan so you won’t have to worry about renewing each month. You really don’t need most “extras” shown above, but I recommend Site Backup Pro (which will automatically create a backup of your site at a time you schedule), and Domain Privacy Protection (which keeps your personal contact information, like your home address, private). STEP THREE: You will receive a welcome email from Bluehost after you purchase your hosting plan. This email will provide a link to your cPanel, where you can install WordPress and get started. (There’s a button that says “Install WordPress”). Select the option that says “automatically create a new database for this installation” and then click the “Install Now” button. If you have any questions, you can always call Bluehost. They’ve always been super helpful when I was confused or thought I had “broken” my blog.